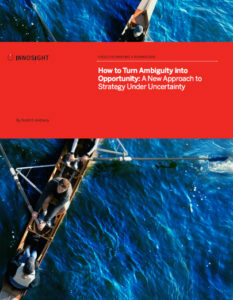 Turning Ambiguity into Opportunity - Innosight Briefing - wendykennedy.com inc.
Innosight has just released its Summer 2016 Briefing: “How to Turn Ambiguity into Opportunity”, by Scott D. Anthony. I am a big fan of their work, as they never fail to provide strong mental floss on topics related to innovation strategy. This briefing is no exception – this 15-page brief centers on how disruption grows markets, and with the right mindset and approach, leaders can build paths to growth they have yet to imagine. Managing the future is a major challenge for business builders because of the ‘shadow strategy’ as Anthony calls it. The shadow strategy refers to the need to “deliver the present” and in parallel “discover tomorrow’s business”. These are two very different objectives and require different skill sets and approaches. This briefing presents a simple framework to create a ‘future-back’ mindset and strategy to turn ambiguity into opportunity. There are many nuggets inside this briefing for entrepreneurial thinkers and company builders alike. I highly recommend you add it to your summer reading list!